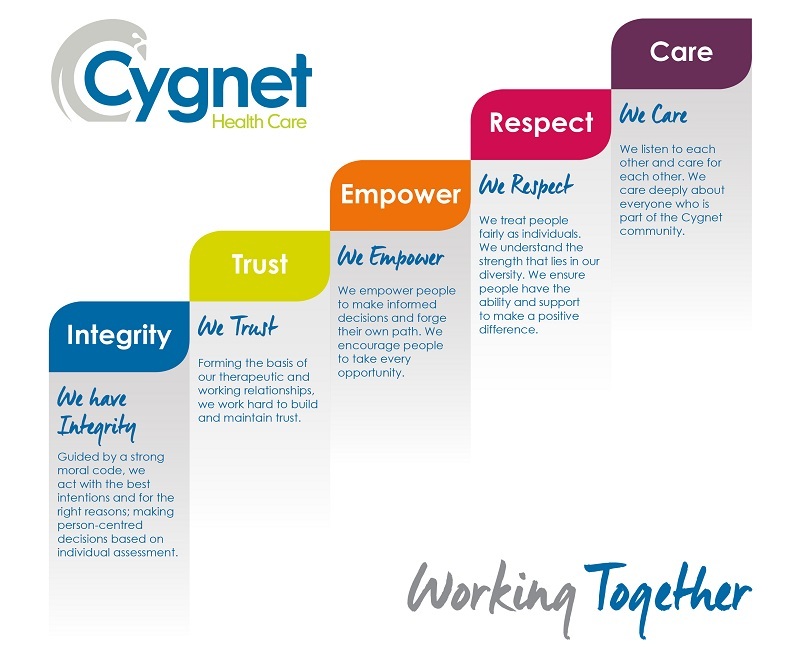 At Cygnet Health Care we are doing all we can to make a positive difference to the lives of the people who form the Cygnet community. To help guide us and make sure we are all working together to achieve this we have identified five values that are at the core of what we do as individuals and as an organisation. We’ve made a series of short films featuring members of our executive alongside employees from some of our services that introduce the values. Guided by a strong moral code, we act with the best intentions and for the right reasons; making person-centred decisions based on individual assessment. Forming the basis of our therapeutic and working relationships, we work hard to build and maintain trust. We empower people to make informed decisions and forge their own path. We encourage people to take every opportunity. We treat people fairly as individuals. We understand the strength that lies in our diversity. We ensure people have the ability and support to make a positive difference. We listen to each other and care for each other. We care deeply about everyone who is part of the Cygnet community.